iii. a component has been strengthened. b) is not excluded from the requirements for LVV specialist certification (Table 3-1-1). The structure of a vehicle may incorporate crumple zones that form part of a frontal impact occupant protection system. Bumper bar means either the structural part inside a plastic bumper or a complete metal bumper as used on older vehicles. 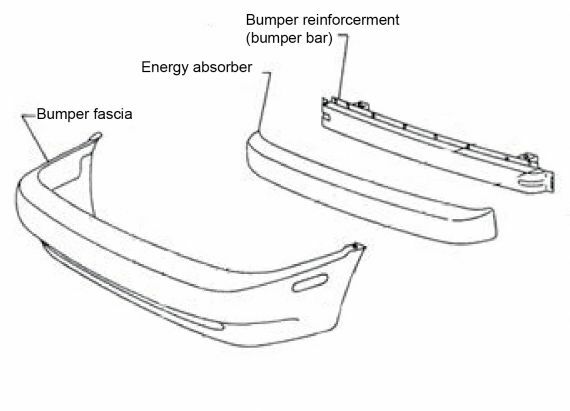 The bumper fascia (bumper cover) is not part of the bumper structure. It is the bumper reinforcement (also known as the bumper beam) that is the actual bumper bar for inspection purposes (see Figure 3-1-3). to the extent that it could affect the vehicle’s structural strength or one of the vehicle’s safety requirements. If the owner questions the decision, the vehicle inspector should recommend the vehicle owner obtain further written assessment from a panel beater. A body lift on a body/chassis vehicle (commonly a 4x4) always requires LVV certification. The modification was carried out on or after 1/3/1999, and the material removed for the side window installation does not contribute to the strength of the vehicle structure (for example, cutting into flat panels does not affect the structural strength, but cutting into bracing material does affect the structural strength of the vehicle). There is evidence of certification of the modification from the company that carried out the modification, ie a secondary certification plate or label in the case of a motorhome conversion (see Technical bulletin 13). the performance of any lamps is not affected as a result of the kit or components. the replacement panels use OE attachment points. the installation is carried out in accordance with the instructions of the seat or harness manufacturer. 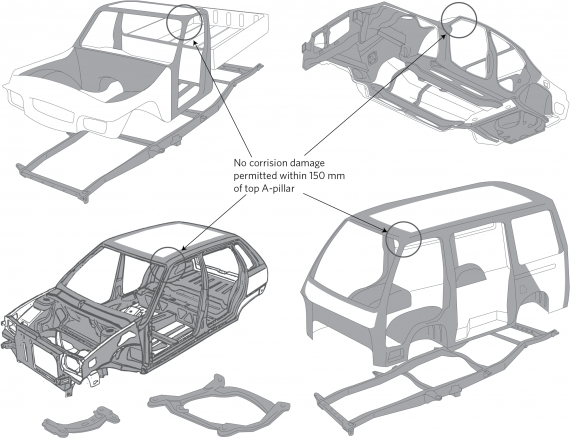 none of the frontal impact components have been removed where the vehicle is required to comply with a frontal impact occupant protection standard (Note 4). the vehicle structure has not been weakened. in the case of a top tether point for a child seat attached to the rear shelf, the top tether point is not located within 150mm of a modification to a rear parcel shelf. any material removed is minimal and is unlikely to have weakened the vehicle structure (including a seatbelt anchorage structure). In-service requirements for performance and condition are met. These include chassis, cross-members and sub-frames, load-bearing monocoque body structures, body mounts and the body on a vehicle with a separate chassis. Other sections also contain Reasons for rejection and diagrams relating to specific vehicle components. See figures for corrosion limits to hinge and latch anchorages (section 6-1), seatbelt anchorages (section 7-5), and front or rear suspension anchorages (section 9-1). Note that the diagram has been updated to take into account the more modern vehicle structures of common vehicles. The bumper fascia (bumper cover) is not part of the bumper structure. It is the bumper reinforcement (also known as the bumper beam) that is the actual bumper bar for inspection purposes. 1. The vehicle must be safe to be operated. 2. The components and materials must be fit for their purpose and within safe tolerance of their state when manufactured or modified.